Introducing the Annalis™ P5 Inspection Torch with integrated Digital Video Recorder. 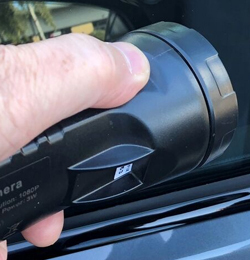 This innovative inspection torch incorporates a high brightness LED torch with low and high beam settings, built-in Wifi for APP connectivity and a compact digital video recorder (DVR). The DVR supports full 1080P video recording, H.265 video compression, audio recording to the G7.11 standard and has an integrated Digital Image Stabilisation system for improved video quality. High capacity storage is provided via a 32GB SD storage card that is upgradable to 64GB. An internal 6000mAH lithium ion rechargeable battery, allows for up to 20 hours use of the torch, up to 6 hours video recording and up to 4 hours, if using the torch and DVR together. Built from durable ABS plastic, this rugged, shockproof and waterproof device is ideal for the most challenging of environments. An IOS or Android based App also provides full control of the torch’s DVR capabilities, allowing you to start and stop video recordings, take pictures and manage the storage of recorded files using the phones memory or uploading to a cloud-based storage account like Dropbox, Google Drive or OneDrive. Law enforcement – The recording of criminal activity, scene of crime records. Maintenance – Visual inspections of cars, trains, train tracks, pipelines, roofs, sewers, drains, domestic plumbing, etc. Real Estate – House surveys, Inventory audits, Tenant damage reports, etc. Industry – Rolling mill and conveyor belt inspections, etc. Store files on your phone. Upload to your cloud-based storage account using Dropbox, Google Drive or OneDrive.